Some operas are so powerful—the music so sublime; the voices so extraordinary—that even questionable staging and mixed metaphors can't dim their luster. 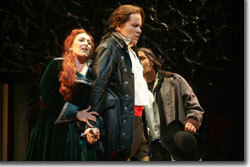 Such is Central City Opera's current production of Don Giovanni. Mozart effortlessly mixes transcendental arias with astonishing ensembles ranging up to six voices, all floating on his inimitable melodies. So pleasing to the ear is the entire cast and orchestra that neither the stylistic dissonance between the traditional costuming and the modern setting nor the unnecessary intrusion of "high concept" props (which resulted in a scenery malfunction in the final moments of opening night) were able to distract us from the sonorous pleasures of the evening. Otherwise, conductor John Baril and director Marc Astafan deliver a well-paced and sensible interpretation of this tragi-comic masterwork. Jeff Mattsey cuts a handsome figure as the title figure and backs up his character's charm and bravado with a versatile and robust baritone. Sally Wolf's seamless, expressive soprano, as Donna Anna, Emily Pulley's especially lovely coloratura, as Donna Elvira, and Deborah Selig's curious, sweet-voiced Zerlina all perfectly compliment Mattsey's Don Giovanni, as well as the fiancés—Chad Shelton's beautiful tenor as Don Ottavio and Christopher Boduc's equally delightful baritone as Masetto— Philip Cokorinos' warm bass-baritone and comedic knack as Leporello, and Kevin Langan's impressive bass as the Commendatore. Astafan's choice to follow Mozart's lead in cutting the final, overly moralistic, chorus keeps the focus on Don Giovanni's inability to control his addictions, rather than on some hypocritical external value system, and reflects the composer's modern sensibilities. 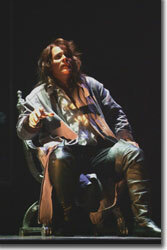 However, the lasciviousness exhibited in ballroom scene at the end of the first act seems out of place, at odds with the social setting of the libretto. If Don Giovanni is to be a narcissistic metrosexual, then give him a 21st Century urban environment, make the corresponding stylistic adjustments, and forego the anachronistic innuendos. Central City Opera's Don Giovanni runs in repertory with Claudio Monteverdi's The Coronation of Poppea and Douglas Moore's The Ballad of Baby Doe through August 6th. 303-292-6700, 800-851-8175, or at www.centralcityopera.org.